All transactions are safe and secure with a reliable history in online purchasing behind each of our associates. 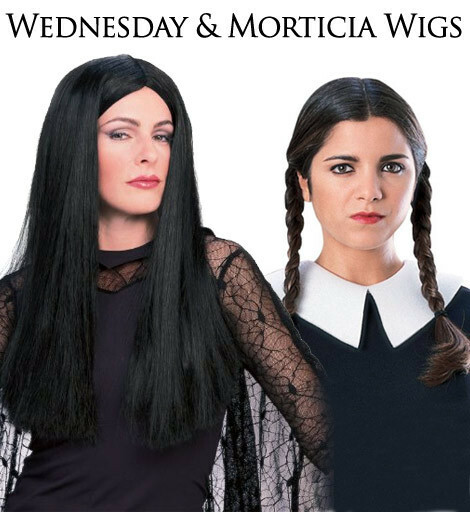 Buy the Wednesday and Morticia Addams Wigs to own Addams Family clothing and merchandise. These Addams Family wigs are fitting for both mother and daughter alike. Choose a Morticia wig to perfectly cap off one of the related adult costumes displayed in the gallery, or order a Wednesday Addams wig with braids to expose your playful Goth side. The bewitching looks will put a spell on everyone you encounter. In addition to the Wednesday and Morticia Addams Wigs above, browse the Addams Family Clothing Gallery for more apparel like men's and women's clothes, kids shirts or hoodies.